Intel Corporation unveiled the Intel® Atom™ processor CE4100, the newest System-on-Chip (SoC) in a family of media processors designed to bring Internet content and services to digital TVs, DVD players and advanced set-top boxes. 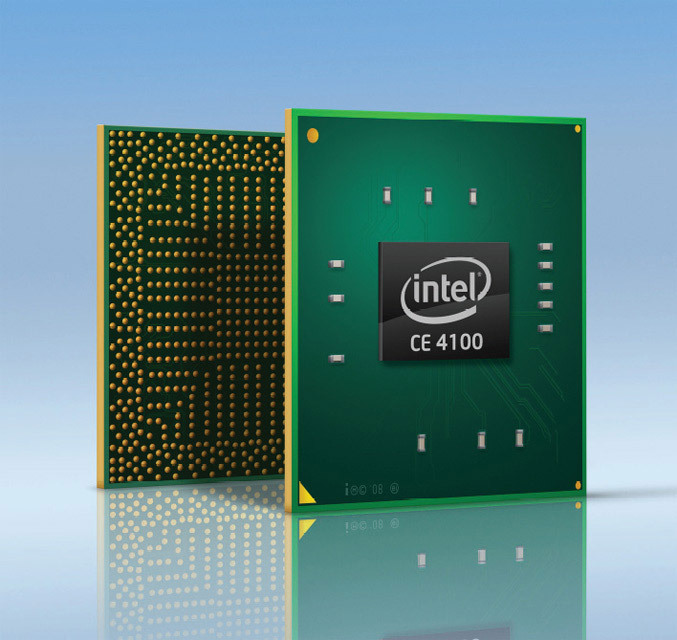 The CE4100 processor, formerly codenamed “Sodaville,” is the first 45nm-manufactured consumer electronics (CE) SoC based on Intel architecture. It supports Internet and broadcast applications on one chip, and has the processing power and audio/video components necessary to run rich media applications such as 3-D graphics. Joining Kim on stage during his keynote were executives from Adobe Systems, BBC (British Broadcast Company), CBS, Cisco and TransGaming. These and other companies are working with Intel to advance content, services and infrastructure for connected CE devices. As TVs become more interactive, Adobe Flash is an important enabling technology to help content developers blend together video, 3-D animation and rich graphics. Intel is working with Adobe to port Adobe Flash Player 10 to the family of Intel CE media processors to optimize the playback of graphics and H.264 video to enable for the first time a wide array of Flash-based content on the television. “The architecture of Intel media processors provides a powerful and innovative platform to showcase Flash-based applications in a vivid way,” said David Wadhwani, general manager and vice president, Platform Business Unit at Adobe. “Flash Player 10 combined with the performance of the Intel media processor and its support for standards such as OpenGL ES 2.0 offers a compelling environment for Flash-based games, videos and other rich Web content and applications.” The companies expect Adobe Flash Player 10 to be available in the first half of 2010 for Intel media processor-based CE devices. Malachy Moynihan, vice president for video product strategy, Cisco Service Provider Video Technology Group, discussed how delivering premium video to the TV will require intelligent networks and content storage. TransGaming President and CEO Vikas Gupta announced an on-demand gaming service called GameTree.tv to be optimized for connected digital TVs and CE devices powered by Intel media processors. The GameTree.tv service will offer a broad library of games such as sports, action and adventure and provide content developers with a software development kit to support the migration of existing games and the development of new games based on the Intel CE platform. It will help revolutionize the delivery and global consumption of video games and provide a turnkey monetization strategy for CE manufacturers and cable/satellite providers (MSOs). Intel CE media processors provide a full-featured software framework called Widget Channel for the development of Internet applications, or TV widgets. Broadcast networks such as CBS are expanding the gallery of TV widgets to help their viewers find and connect to premium content in a more personalized manner. The CE4100 processor can deliver speeds up to 1.2GHz while offering lower power and a small footprint to help decrease system costs. It is backward compatible with the Intel® Media Processor CE 3100 and features Intel® Precision View Technology, a display processing engine to support high-definition picture quality and Intel® Media Play Technology for seamless audio and video. It also supports hardware decode of up to two 1080p video streams and advanced 3-D graphics and audio standards. To provide OEMs flexibility in their product offerings, new features were added such as hardware decode for MPEG4 video that is ready for DivX* Home Theater 3.0 certification, an integrated NAND flash controller, support for both DDR2 and DDR3 memory and 512K L2 cache. The CE SoC contains a display processor, graphics processor, video display controller, transport processor, a dedicated security processor and general I/O including SATA-300 and USB 2.0. For more product information, visit www.intelconsumerelectronics.com.